This article is 2961 days old. The first time I visited Casino Windsor (when it was located in the old art gallery), was on my 17th birthday. I was allowed into the building because I was pushing my aunt in her wheel chair. My mom gave me $20 to gamble with, and I played video poker. I won $80, and then risked it all over the next 20 minutes, leaving the place with no birthday bucks, but a good story to make my friends envious. Love it or hate it, the casino is a major part of Windsor, both past and present. Windsor’s gambling identity didn’t emerge with the art gallery take over in 1994, though. It’s been a tradition in the area for centuries (or as long as there have been aboriginals around here). The North American natives played two types of games: those that required skill, and those of chance. There are some that say casino games can be mastered, but I believe there’s more luck involved than actual know-how. There’s more to the games than just the rules, though. 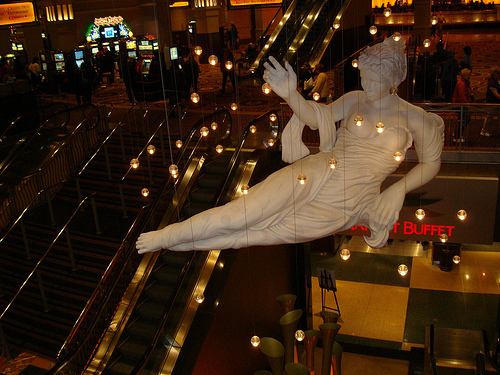 The atmosphere inside Caesars Windsor is shiny and fun, and an excellent way to escape the humdrum of regular life (as long as it’s in the budget). The desire to play and the desire to work are both characteristics that are consistent in human behaviour. Games are our way of organizing our play time, formalising it with rules, and nurturing the ego by besting our competitors. The ability to play is a basic human need. The Ottawa tribe of First Nation people that lived in this area were known to play Bowl, a game of chance that consisted of tossing eight differently coloured pebbles into the air. They used a bowl to lightly toss the rocks, and any that fell out of the bowl didn’t count. Bets were placed on how many pebbles would land with matching colours facing up. There was also a game called Straws, which I imagine is similar to pulling straws to find a loser. And we can’t forget about Lacrosse. The game was named such by the French Jesuit missionaries in the 17th century; apparently the stick the aboriginals used to play the game reminded them of the cross that their bishops carried. The game was played for sport, but also to settle disputes between tribes. And of course, stakes were made, possessions lost and won. So whether you’re inclined to drop some cash at the casino, or toss some rocks, allow yourself the time to play. Games have evolved some since the beginning, but their merit is still the same. Build some skill, trust a teammate, outsmart an adversary, and have some fun.